I'm obsessed with video games. No news flash there. I can mark months of my life with the games I've played, the games I heard about, the new systems I got or the articles about video games that I wrote. For me, it's games, games, games all the time, which is why, when I look back on 2012, I can see it through the filter of games. This is a crazy month because, suddenly, I'm in charge of Kotaku. No pressure! On the eighth of the month I land in Las Vegas and am waiting for a cab to take me to the Red Rock Hotel & Casino for the DICE summit, an annual gathering of various captains of the gaming industry and assorted press barnacles like me. While waiting on that taxi line I spot game designer Tim Schafer and a contingent from his studio, Double Fine. One of them tells me that they might have a news item for me shortly. A couple of hours later, they've tipped one of the most influential dominoes in the year by launching a Kickstarter campaign for a new Double Fine adventure game. A day later, during a break in the DICE summit, Schafer and I sit for a brief interview. Our interview lasts 22 minutes, including an interruption from Leisure Suit Larry creator Al Lowe, who will later launch a Kickstarter of his own. 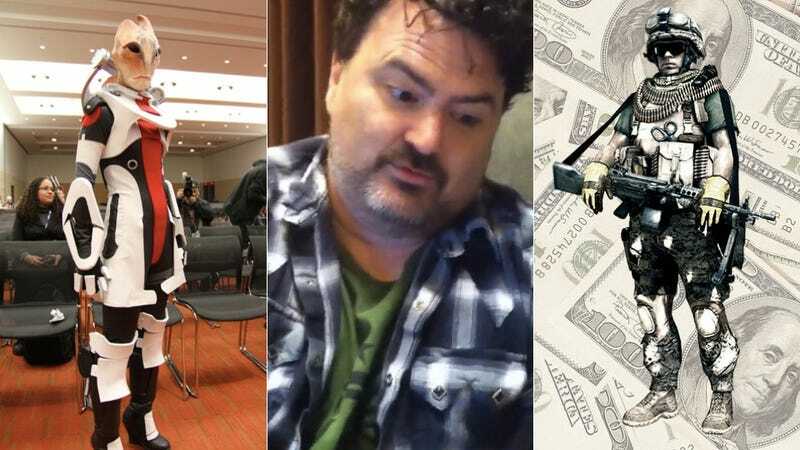 During those 22 minutes, the Double Fine Kickstarter earns $23,000. I play a lot of PlayStation Vita this month. This is also the month we tell everyone what a Durango is. …and I interview a trio of top Zynga people, not all of whom will even make it at Zynga through the next few months. Those interviews, at times encouraging, at times baffling, sit on my tape recorder for a few months until the company begins to hit extremely rough waters. At that time, I figure, it's worth a look at what these people think they're doing with and to video games. The bubble bursts. The blood is in the water. The knives sharpen. Also, this month: Our team is split about whether Mass Effect 3's ending should be changed. I come out in favor of gamers asking for tweaks. Games are interactive, I write. They are the malleable artform. Today people got angry about Mass Effect 3—for a new reason. After interviewing the studio chief behind the next Splinter Cell I pose a question that seems to keep popping up in various ways in 2012: "What If The Next Generation Thinks Video Games are Stupid?" This is the year, it seems, that even people within the world of video games, routinely fret that games are losing touch with what's new and exciting. Oh, and we tell the everyone what an Orbis is. In this month, I publish one of the stories of 2012 that I'm most proud of reporting. It's about the death threats people send to game developers and how those creators cope. I go to Santa Monica for a week and play a bunch of E3 games early. This is when I first play XCOM: Enemy Unknown, the new Sim City, Metal Gear Rising: Revengeance and a bunch of other games. I download Diablo III over my hotel's internet and start playing it on a Macbook Air, while the rest of the team chronicles the game's crazy launch problems. It's in this month that I play and review the worst game I'll play all year. I go to E3, where I marvel at Watch Dogs and scratch my head at Nintendo Land. I come back and tick off a bunch of Nintendo fans when I write about the Wii U's expected lag in horsepower. The story of mine that I'm proudest of this month is my interview with a guy who pays money to essentially be able to press a win button in Battlefield 3. It's about the not-so-underground world of paid cheats: "One Shot, One Kill, No Skill: Why a Regular Gamer Started Paying to Cheat at Video Games." 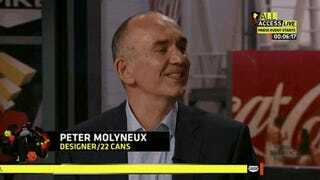 I'm on the other side of Molyneux. I saw that missed fist-bump up close! History, witnessed from stage right. This is a slow month for new games but another exciting month for Kotaku. We begin publishing shorter versions of some of our reviews in The New York Times. We also get out of the way a little more and start to let readers ask top game developers and other interesting sources questions directly, live. In just that month, we do that with the makers of Braid and Spy Party, an anonymous gaming clerk, an anonymous employee from a large game publisher, the people behind 2012's oddest new game console announcement, the guy leading the creation of Assassin's Creed III, a teenage Xbox Live griefer, and the best gamer in the world, among other people. Game designer Terry Cavanagh sends me a near-final version of his iPhone game, Super Hexagon. Bliss. Suddenly my iPhone is my gaming platform of choice. It's also the month of my oddest interview of the year when, on the morning of August 15, I fly from New York to San Francisco to interview Nintendo CEO Satoru Iwata, then meet our own Kirk Hamilton in a café, head back to the airport and fly back to New York that evening. Let's call that an unusually long commute. Oddly, I don't remember much from September. I'm pretty sure I spent a chunk of it playing Resident Evil 6. Ugh. It's also the month I ran one of my personal favorites of the year, a look at the subculture of people who are trying to put every Super Mario game on one timeline. This is the month I play Assassin's Creed III and put myself on the side of people who like what is probably the year's most divisive game. … on the second day of the month, having experienced no serious personal hardship from superstorm Sandy, I wander down to the Brooklyn promenade and shoot video of one of the strangest things I'll probably ever see in my life. Downtown Manhattan, almost entirely blacked out. Later in the month, a sight of an altogether different sort: Wii U line-waiters meeting the president of Nintendo of America. That evening, the Nintendo chief tries to convince me that ZombiU is so good it could be a system-seller. I scoff. Later that month I play it and realize he was right. I re-discover my 3DS, switching to downloading most of the games I get for the system. I also inch ever closer to actually being a bona-fide PC gamer by… plugging my gaming PC into a TV and an Xbox controller and treating it like a next-gen console. Baby steps! I stare wide-eyed at the number of fascinating games that I still want to finish playing. So much for this being a slow off-year for video games. And I write this piece you're reading now, looking back at a Kotaku that has been filled with superb content written by a couple dozen amazingly talented writers, reporters, critics, columnists and a single, stellar video editor and I think: yep, these people made me look really good. You readers helped a ton, too. Thank you. What was your gaming year like?